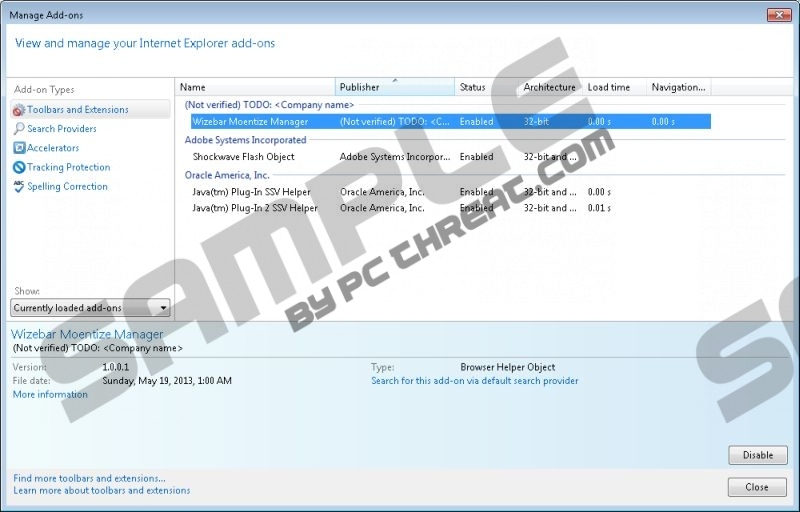 If you have installed Wizebar on your system, do not be surprised if you are going to notice various annoying advertisements on your screen because this program is nothing more than just an advertising-supported application. Unfortunately, you will not be able to stop those ads easily because this software is compatible with all the major browsers, including Internet Explorer, Google Chrome, and Mozilla Firefox. As this Melodx product does not seem very beneficial, you should delete it from the system without any further considerations. It is especially applicable to those computer users that seek to protect their systems at any cost. As other advertising-supported applications, Wizebar will not only flood your screen with various commercial ads, but might also expose you to threats if you keep clicking on them. In most cases, adware programs, including Wizebar, collaborate with third party advertisers; thus, you should not expect that this program is going to take care about your safety. On the top of that, some of the information regarding your browsing processes might be collected in order to display you ads that would match your interests. In most cases, these ads are based on your search queries and your browsing history mainly. If you do not like the idea that somebody is spying on you, keep in mind that you can remove Wizebar whenever you want to and thus stop this undesirable activity. It is not likely that you will be able to download Wizebar from its official website; thus, it is very likely that it is distributed bundled with freeware. In order to avoid different kinds of unwanted applications in the future, you should always make sure that the program is reliable prior the installation. In addition to this, it is also very important to select Custom/Advanced installation options in order not to allow different kinds of unfamiliar programs enter the system. If you are ready to stop those ads and coupons under the name Puriffier, you should delete Wizebar as soon as possible. This can be done manually or automatically; however, our specialists recommend deleting the adware automatically if you have no experience in malware removal. Make sure that you choose a reliable antimalware tool for this activity. In our opinion, SpyHunter is one of those tools that can be trusted 100%. Locate the unwanted software and select it. Right-click on Wizebar and click Uninstall. Click on the undesirable program and then select Uninstall. Quick & tested solution for Wizebar removal.